In this section of Interesting Animal Facts you will find a list of Desert Tortoise facts. These amazing animals have adapted to living in the extremely harsh conditions of the Mojave desert and the Sonoran desert where many other animals cannot survive. 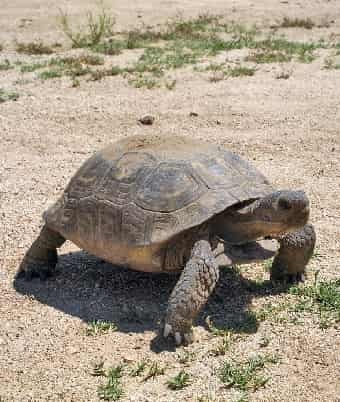 On this page of Desert Animal facts we provide information on the two species of desert Tortoise. You will find a listing of facts including how they survive, what they eat, and why their population has drastically decreased over the past few decades. This information is written for both kids and adults. Click here for a great selection of Amazon.com books about the Desert Tortoise. Gopherus agassizii - found in California, Arizona, Nevada, and Utah. Gopherus morafkai - found east of the Colorado River in Arizona and Mexico (Mexico states Sonora and Sinaloa). Desert Tortoises are approximately 10 to 14 inches long (25 to 36 centimeters). The males of both species are slightly longer than the females. Their approximate height is 4 to 6 inches (10 to 15 centimeters). They weigh 8 to 15 pounds (4 to 7 kilograms). The Desert Tortoise is a herbivore. It's diet consist mostly of grass but it also eats, herbs, wildflowers, shrubs, and cacti. Their life span is thirty to fifty years. They have shells which range in color from greenish-tan to brown and have a high dome. Predators of this animal include ravens, foxes, gila monsters, badgers, roadrunners, and coyotes. The Desert Tortoise is the official reptile of California and Nevada. This creature can survive in a climate where temperatures can exceed 140 degrees Fahrenheit (60 degrees Celsius). Desert Tortoises dig burrows where they go to escape the heat of the summer, the cold of winter, and to protect themselves from predators. These burrows can be more than five feet deep and they can spend over ninety percent of their time in them. Several tortoises will usually share a single burrow. An adult desert tortoise can survive a year or more without water. In the spring they obtain water mostly from the moist grass and other vegetation they eat. Their bodies conserve this water efficiently. One method these tortoises have found for surviving the harsh desert climate is to dig catchment basins in the dirt to capture what little rainfall there is in the desert. When it rains they go to these basins to obtain the precious water. These animals are very inactive. This helps them maintain water when the temperature is hot and survive the extremely cold winters. In fact they hibernate during winters. These creatures are built for digging. Which is important because they dig burrows in order to survive. Their front limbs have flat claw-like scales which are perfect for digging. Another interesting Desert Tortoise Fact is that they prefer to live where the soil is ideal for digging burrows. The soil should be soft enough to dig but firm enough not to collapse. The quality of the soil influences the density of desert tortoise populations. A female Desert Tortoise will lay 4 to 8 ping-pong ball sized eggs at one time. She will usually lay the eggs in June or July and they will usually hatch in August or September.